iDogmate impressed us with its’ innovation and unique design. Available in two sizes, iDog ball thrower has plenty of punch and even comes with a remote control. 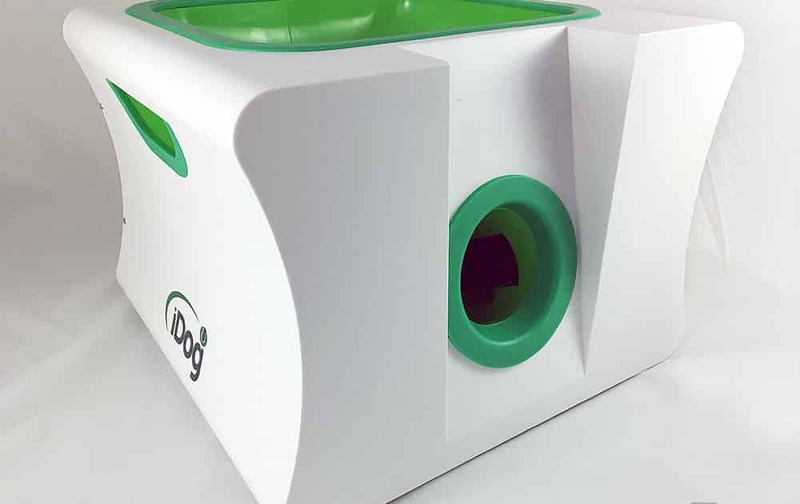 iDog introduced an impressive and uniquely designed automatic ball launcher for dogs of all sizes. We wholeheartedly support the company’s creative product design and were very excited to review the iDog ball launcher. Interested in seeing how it stacks up to other automatic ball launchers for dogs? Keep reading below where we dive into the unboxing and design, features, and performance of the iDog ball thrower. When you order your iDog ball launcher online, it actually ships in an iDog branded box instead of a traditional plain brown shipping box. 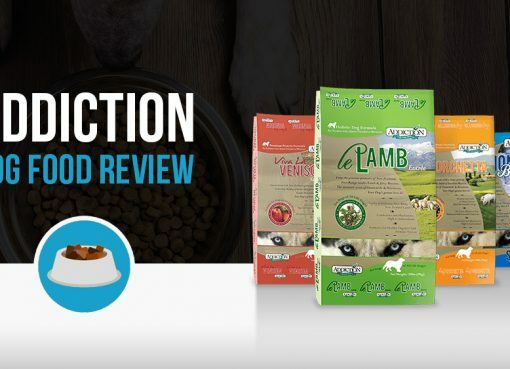 We appreciate the attention to detail in regards to package design and branding, which is definitely a step up from the Doggy Fun launcher branding confusion. All of the packaging contents inside were in great shape and very well protected during shipping. Aesthetically speaking, iDogmate’s design is superb. We absolutely love the creativity and uniqueness of this automatic ball launcher as there are no other products on the market like it. The white and bright green color palette matched with the sleek curves and solid frame makes this an A+ in design. Looking down onto the unit you will see the bright green ball chute which funnels the ball into the machine to prepare for launch. The ball funnel area is wide which we absolutely love, especially if you plan on teaching your dog how to play a game of automatic fetch. The wider the area for your dog to return the ball to, the easier it is for them to learn. For example, we tested the SmartPult ball launcher which had a very small ball funnel on the top of the device which results in difficult training. Moving to the side you will see two green handles for moving the launcher. If you plan on using the large version (iDogmate Midi), these handles come in handy because the iDogmate Midi launcher was quite a bit bigger than expected. These make it easier to move the ball launcher outdoors for a quick game of fetch and then bring it back inside for more playtime. On the back of the device you will notice a power switch to turn the device power on and off with the AC adapter port, and then an actual on/off button to be used with the rechargeable lithium ion batteries. The two power buttons are a bit confusing, but essentially, the bottom “switch” will turn power on to the device from a wall outlet. The power button on top will actually turn the device on or off from the internal batteries. Finally, another button is used to toggle between the available distance settings. In this picture you will see a close-up of where the ball is placed and where the ball is launched from. The front launcher uses two spinning wheels which spin faster and faster until it’s reached the intended speed and then the ball is dropped in; once the ball comes in contact with the rotating wheels, it’s launched! 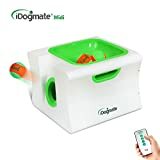 iDogmate comes with a whole slew of exciting and unique features that will surely entertain your dog while also promoting invigorating exercise. Let’s take a look at all of the fun iDogmate features and discuss how they work. 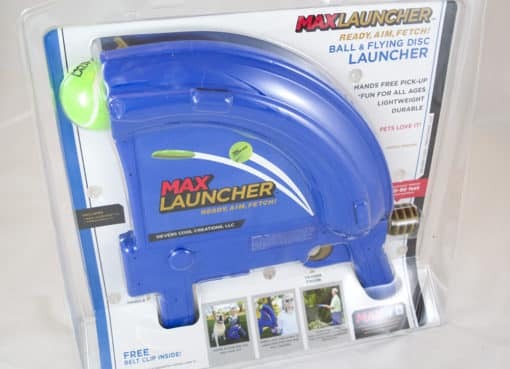 Much like the iFetch ball throwers which top our automatic ball thrower comparison list, iDogmate sells two versions of their automatic ball launcher for various sized dogs. The Large version launches regular sized tennis balls (2.5″) just like the iFetch Too and GoDogGo while the Small version uses mini tennis balls (1.5″). 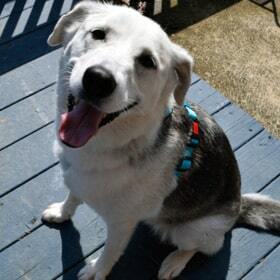 We personally use the large version as our doggy testers are typically 50lbs and up. How cool is this? iDogmate comes with a mini remote control so you can adjust the distance settings, reset the device, and power it on and off. The only other automatic ball launcher with this functionality (as of right now) is the GoDogGo launcher. If you have your dog trained to return the ball to the device for fully automatic fetching, controlling the device with the remote is a great way to change up the distances and keep your dog’s mind active. As we mentioned earlier, iDogmate uses standard 2.5″ tennis balls which is intended for use by medium to large dogs. Their smaller model uses 1.5″ mini tennis balls which are not intended for large dogs. We received 3 balls with the large version and the balls themselves are of very high quality. This is an industry first! Most automatic ball launchers on the market use 6 C batteries, which as you may know, can be quite pricey especially with frequent use. iDogmate added fully rechargeable lithium ion batteries which the manufacturer claims can shoot up to 1700 balls with a single charge – that’s a lot of play time! We field-tested the iDogmate among other automatic ball launchers to compare launch distances, ball reload times, and sound levels (for those dogs who are nervous around loud noises). Check out our detailed performance metrics on the iDogmate interactive ball launcher! Overall each settings was fairly consistent and there was a good variation between the different distance selections. The very high settings impressed us with not only how far it launched, but also the arch on the ball. Each ball got pretty high in the air so your dog can actually catch it if they’re quick enough, instead of just running after a rolling ball. Take a look at the video here to see the launch power in action. We tested the decibel levels of the iDogmate ball launcher to give those of you with nervous dogs some peace of mind. You can see from the picture to the right that the peak decibel reached 76dB while the average was only 55dB. This is equivalent to a normal conversation – so not too bad! Basically, the iDogmate has a bit of a higher pitch whine as it winds up and prepares for a launch, but it’s not bad at all. In fact, it’s right on par with the Doggy Fun sound levels but the crazy thing is that this iDogmate is twice the size and uses full-sized tennis balls while Doggy Fun uses mini balls. Overall, we are very impressed with this new-to-market ball thrower. The design is 100% original with bright and vibrant colors and the features are plentiful, including multiple sizes and a remote control. iDogmate is also an industry first to include a fully rechargeable lithium ion battery for outdoor use instead of relying on tons of C batteries. A few of the minor drawbacks include the size (the large is a bit… large) and the overall cost of the larger unit. The iDogmate is definitely a higher-end device that may be out of some buyers’ budgets. However, if you are willing to take the chance, iDogmate ball launcher will not disappoint. Great reviews thus far. Keep them coming! Looking at getting a idogmate but since there is little info available online so far about it and its high cost, I’m a little gun shy. Durability is my main concern. Are the wheels inside the unit made of rubber? 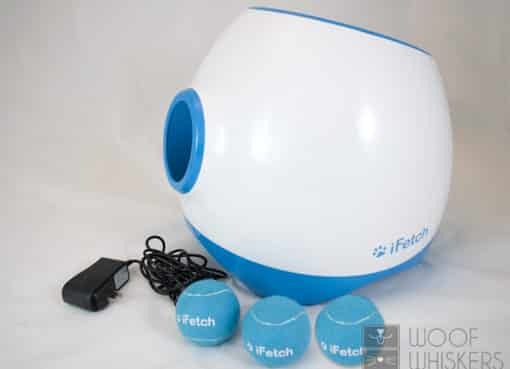 I had an issue with the ifetch too where the rubber wheels wore out within weeks and had difficulty shooting out the balls after. I bought this item with high hopes for my dog to enjoy . Within one week of purchase the ball won’t go but 5ft and then now the lever where the machine let’s it know there is a ball in there is now pushed in and stuck . It took two weeks and now the thing won’t work . Very very disappointed when I spent this much money for something that lasted two weeks . Please corporate contact me to resolve this issue . Hey Sara, sad to see that it didn’t last long. Ours is still chucking along nicely. If corporate isn’t answering, I’d at least send the complaint to Amazon. Often times they will work with you on obtaining a refund if the seller doesn’t respond. Either way, it’s not a good sign that you can’t get in contact with them.